Greater Yarmouth has an exciting programme of evening firework displays throughout the borough from May to Christmas to delight visitors and residents of all ages. Hemsby fireworks are the first to light up the skies at Whitsun on Sunday 27 May 2018 at 10pm and in summer, starting on Tuesday 24 July 2018 and running for six weeks. Our famous Great Yarmouth summer fireworks displays are set to continue in 2018, commencing on Wednesday 25 July 2018 and running for six weeks with live entertainment on Sealife Centre Gardens from 8pm, seafront attractions open late and fireworks displays at 10pm. Every Wednesday evening for six weeks the skies over Great Yarmouth are illuminated with our fantastic summer firework spectacular. 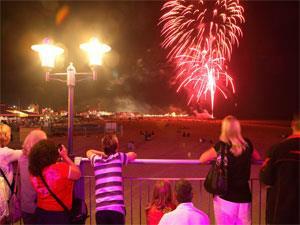 Great Yarmouth Pleasure Beach will be hosting an Halloween Firework Display on Wednesday 23rd October at 7.30pm. 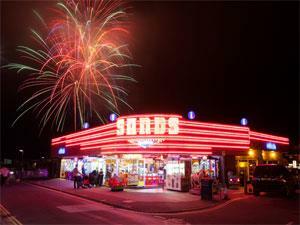 In Great Yarmouth you'll get a great view of the lights and the fireworks from anywhere along the seafront esplanade, or Britannia Pier and Wellington Pier are good spots for watching the beach based fireworks. Firework displays are also on the menu to herald the start of late-night Christmas shopping and the Christmas Lights Switch On in Great Yarmouth town centre on Friday 23 November 2018 and the Christmas Lights Switch On event in Gorleston High Street on Sunday 25 November 2018. All firework events are funded and brought to you by the Greater Yarmouth Tourism and Business Improvement Area Ltd with the exception of 23 November which are funded by the Great Yarmouth Town Centre Partnership.